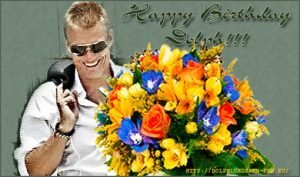 Today 03.11 Dolph Lundgren celebreates his 61st birthday. We wish him all the best in his life!!! Yep, we need to rest a bit, so sorry about lack of news but we’re restoring the lost info after hosting provider problems that was caused. EXCLUSIVE: In a crushing blow to fans of The Expendables, Sylvester Stallone has washed his hands of the franchise. He has withdrawn from taking part in the fourth installment, even though, sources said, it would have meant the biggest upfront payday in his career at north of $20 million. The reason? He and Nu Image/Millennium chief Avi Lerner could not find common ground on a new director, on the script and on certain qualitative elements of the film. That went right down to the selection of the CGI house to handle visual effects. The franchise has used Lerner’s own VFX house, Nu Boyana in Bulgaria. This is how he spent his Christmas this year:) Photo from the Facebook. Dolph Lundgren has bee named as the World of Tanks Swedish Tanks Ambassador as was announced along with today’s introduction of Sweden’s tank forces. The two lines of vehicles to roll into game are Swedish tank destroyers and light, medium and heavy tanks. Swedish tank destroyers may start off somewhat conventional, but that all changes at higher tiers. The hallmarks of these vehicles are very low profiles—sometimes the best in class—that let them secure unusual, potentially game-winning positions. Throw in decent gun depression and firepower, and you have intimidating snipers on your hands. The mixed Swedish branch brings a total of ten light, medium and heavy tanks. At the top of the tree, you’ll discover the mighty Tier X heavy tank Kranvagn, which is a mouthful to say but a joy to play. If you’re wracking your brain for a similar tank, the Kranvagn sits in between the AMX 50B and T57. Lundgren joins fellow action cinema star Steven Seagal who has been working with Wargaming on World of Warships. I’m so sorry for being away for so long! Job, university, kids and private life makes it no time for hobby, but I’m doing my best to keep it up:) So, thanks to our visitor robert I’m sharing with you next video about Dolph as a demon-hunter. This is his first:) As we remember, he has kill alien, has been a preacher/ghost, a kindergarten teacher, a cop, FBI agent, a doctor, a trainer, the cyborg, a boxer, a husband, a knight, a son and a revenger also a zombie killer, but never the demon hunter. So now we can see him in this movie. What next.. werewolf or a vampire? The movie it self can be seen since 3 March 2017. Almost by the time my birthday comes:) Lovely gift isn’t it! Recently there was a Photoshop Battle on Reditt.com in which contributors to the site used Photoshop to enhance a green background photo of Dolph Lundgren with Margaux and Isabella Isaksen. In the gallery below were some of the best images.